We’re excited to announce that our friends in psych-folk outfit Quilt are the next artist featured in our SOUNDS DELICIOUS series. They’ve reimagined the lost folk masterpiece Spirit of the Golden Juice in its entirety. It wasn’t widely released at the time with most copies being handed out by McMahon as he hitchhiked from California to Texas. Indeed, it would be decades before it was rediscovered and hailed by critics as a masterpiece filled with timeless protest songs balanced against freewheeling melodies. The themes and ideas McMahon shared prove as powerful and relevant today as they were when the album was originally written nearly 50 years ago. 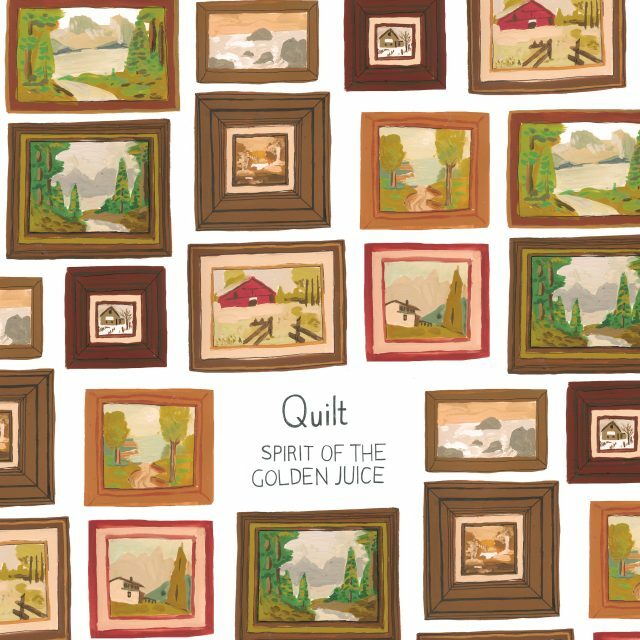 Quilt says of the album, “Once in a while you find an album that you can listen to anytime, anywhere and get swept away in the current regardless of your surroundings. Spirit of the Golden Juice is one of those albums, and one that we have all enjoyed together as a band in the van on tour. Through pure chance, we became friends with FJ McMahon after he contacted us online three years ago, and we have mutual admiration for each other’s music. We decided last year to cover Spirit of the Golden Juice. Our own Keven Lareau engineered and produced it, and it was recorded over the course of several months between New Hampshire and New York. Quilt’s version is only available by subscribing to SOUNDS DELICIOUS. In addition to a deluxe edition for our Kickstarter supporters, it’s available on super limited olive green colored vinyl for recurring subscribers and gift orders of 6-months or more (while supplies last) and on black vinyl for all other orders. Only 1000 copies were pressed in total! These are expected to ship mid-September.